From 27th January 2014, a box of items from the Athens label Phase! Records. My mitts went straight to the two vinyl items first of all, both twelve-inchers. The one by Sewn Leather (PHR 104) certainly promised some heavy industrial action with its grey and grim visuals…the back cover looked at first glance like Battersea Power Station hanging upside down in the air. I looked again, and found it was more likely to be an inverted photo of a classical Greek ruin. At this point I thought “it’s about time some experimenter took on the more overblown and pretentious Pink Floyd albums, Animals being one of them, and punctured the illusions of that flying pig once and for all.” Of course Sewn Leather isn’t anything like that, but he does deliver a punchy one-sided album of black noise with shouted chanty vocals, power beats, and disgusting electronic squeals of feedback and skroink that are pretty painful to endure. I imagine this is very much in the Whitehouse mode, but I never heard a single Whitehouse record – I’m just going on hearsay. Sewn Leather also keeps his chants stuck in a monotonous range that proves equally grating and insufferable. Great! 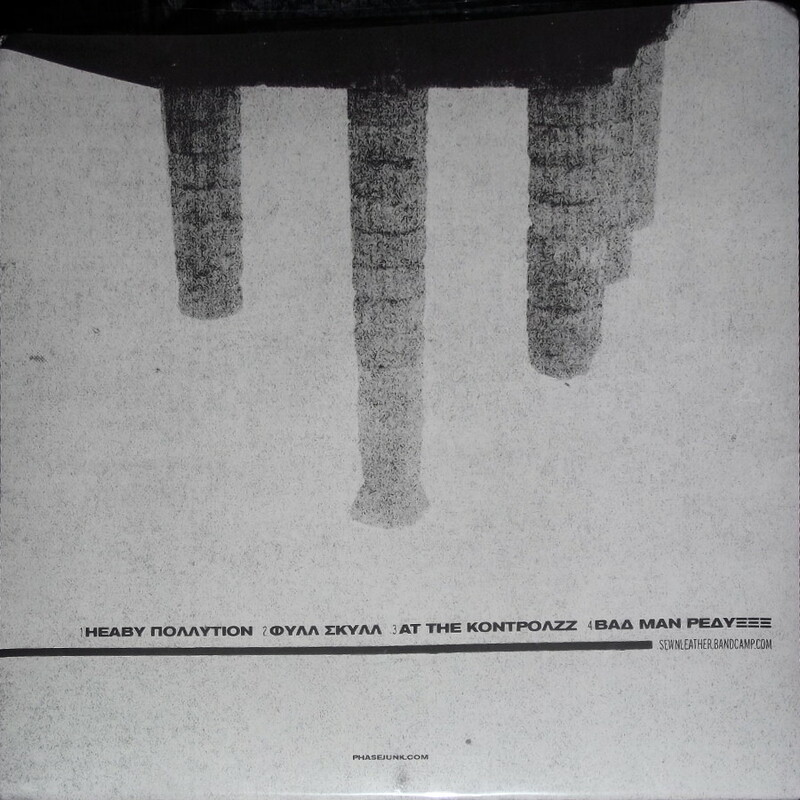 This fellow sometimes appears as Skull Katalog or Griffin Pyn and has been slipping about on the floors of sweaty noise venues for over 10 years since his first self-released single in 2004. Score so far: one knockout punch to the bread-basket. 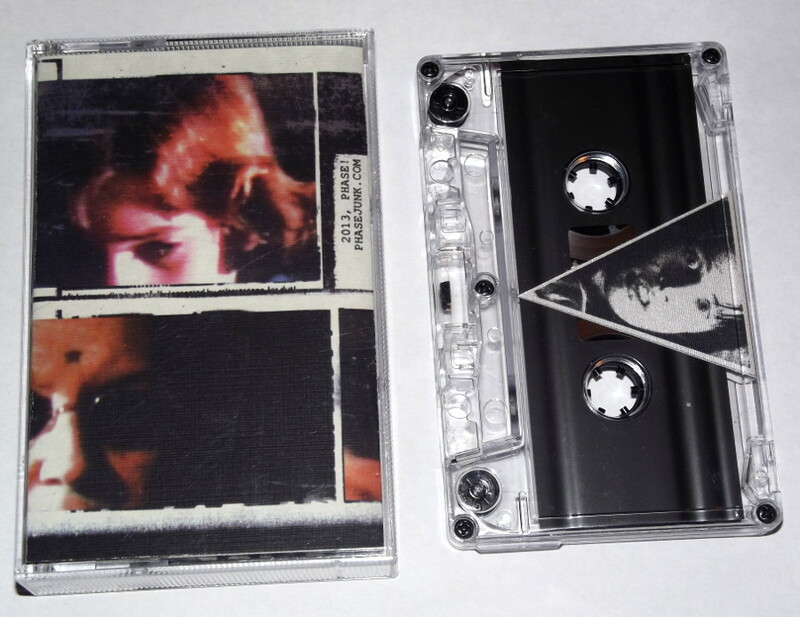 Next vinyl item is a split (PHR 100) with a screen-printed cover in purple ink on light blue card. The image of a poodle with blank alien eyes is at once completely preposterous, hilarious, surreal, and mildly disturbing. On wraparound ‘obi’ strip you can see photos of said poodle receiving a trim at the barbers. The visual schema so far makes no sense whatsoever, unless it’s a metaphor for the current economic crisis in Greece, which is no laughing matter. 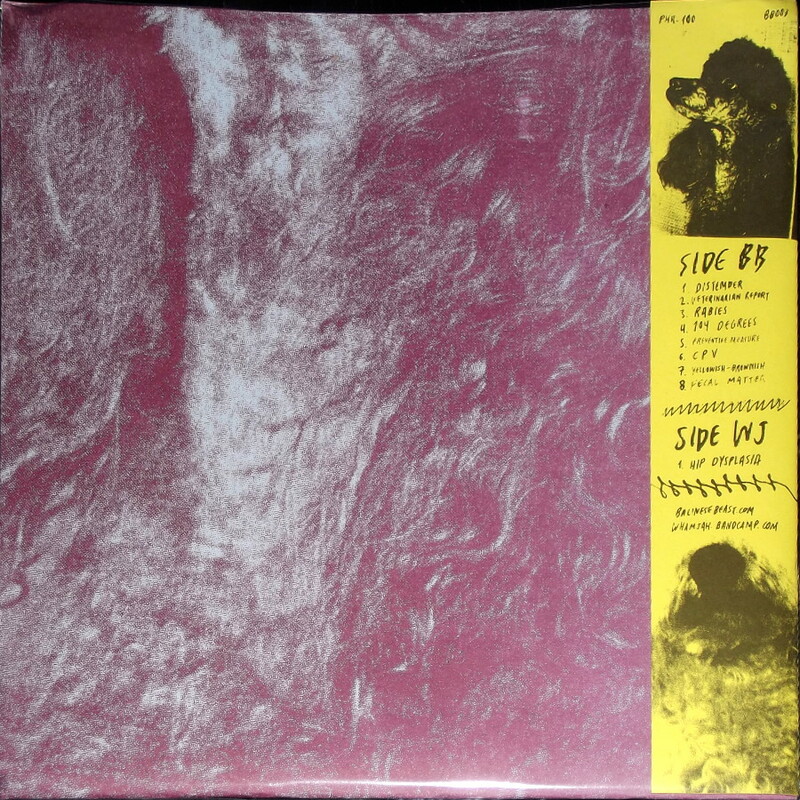 On one side of the vinyl, Balinese Beast turn in a confusing set of errant electrical and feedback noises, with eight titles that have been plucked from the pages of a veterinary manual. There are drones, sparks, shocking ejaculations, and collaged cut-ups. 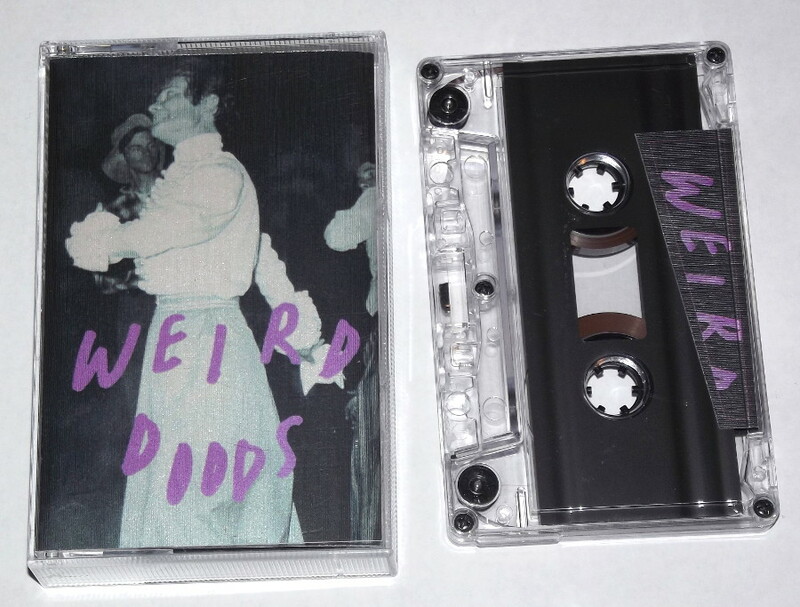 Everything appears randomly and each groove contains an unexpected surprise, and it’s good fun even if the actual experiments are not especially daring from an aural standpoint. 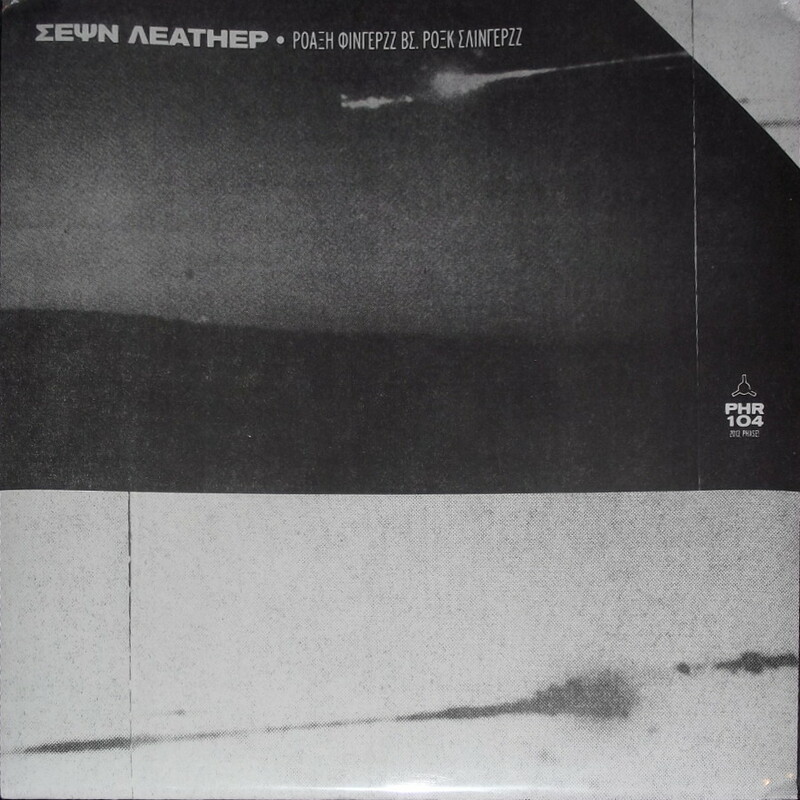 The force of this jittering noise splurge is slightly weakened by bad recording, or a poor vinyl pressing (or both), but the half-baked craziness of this side has a free-wheeling attitude which I find quite endearing. Balinese Beast turns out to be two guys Giorgos Axiotis and Ilan Manouach who do it using no-input mixing desks and saxophones, combined with field recordings. Score so far: short back and sides to the dogs. 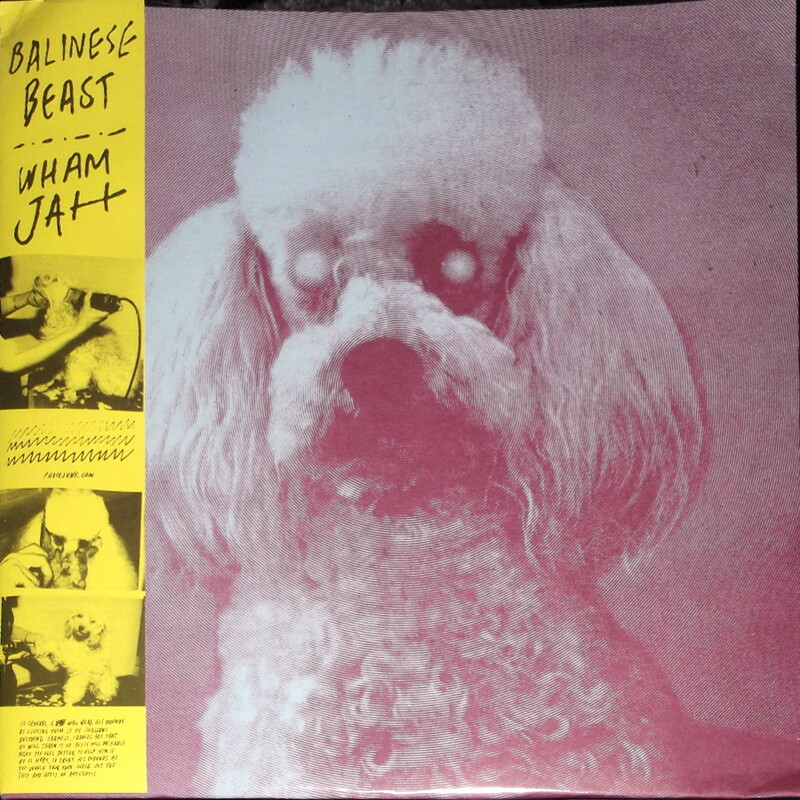 Wham Jah first came our way in 2012 with their Wham Jazz record for this same label. They offer a single track on their side of the split, ‘Hip Dysplasia’, which nonetheless goes through a few interesting changes and offers the listener a speedy guided tour through the corrugated iron shack which Wham Jah call home. This side also struggles to be heard through a layer of grunge caused by cheap recycled vinyl, but it adds to the friction of what I assume is a live recording. Wham Jah are more in the nature of a conventional “band” than an experimental “project”, and half of the time we’re just hearing straightforward noise jamming on top of a very ordinary rock beat. Nonetheless, there’s enough mad squealy outpouring on the record to quench your desires, and the pseudo-ethnic wailings (produced by keyboards, synths or shenai?) will also help Wham Jah to pass the ISO noise audit which I understand is due to take place in Athens later this year. Score so far: 50 points deducted due to duff drummer and crappy band name, but 15 bonus beats for the noisy bits. Next aural item is a three-inch CDR mounted on a piece of thick card. 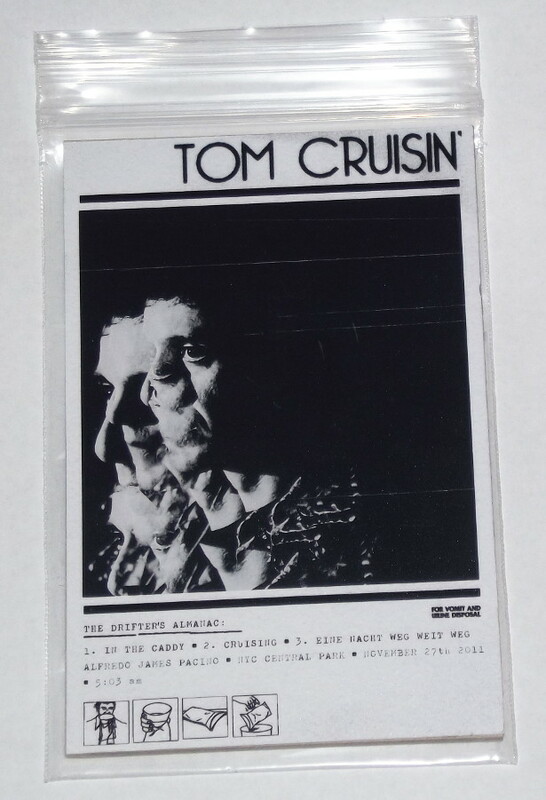 The Drifters Almanac (PHR 101) is by Tom Cruisin’. This is without doubt the worst name for a band I have ever seen. It’s also a ghastly record. A blatant Suicide imitation, which misfires badly and instead comes over as the sick ghost of Elvis suddenly appearing at a synth-pop amateur night. Giorgos Axiotis of Balinese Beast (and five other bands to boot) is the man responsible for this abomination. The Poodle LP’s starting to look better every minute…massive mark down on the Phase Records scorecard for this stinkeroo, and for punishment Axiotis must write out the lyrics to ‘Frankie Teardrop’ 100 times on the blackboard. First of these is by N.213, i.e. Nic Hughes from Vancouver with his Meat Sweats (PHR 105). A real loner bedroom genius of the sort you thought no longer existed, N.213 overdubs himself on his four-track recorder using guitars, synths, percussion, and found tapes, doing everything in a mad, cluttered, obsessive fashion. He also sings his pained and introspective plaints in a voice haunted by alienation, paranoia, and other unhealthy emotions. Great! A really harsh and antisocial listen which could easily have been made at any time during the wild and fitful years of 1980s, and is all the better for it. For people seriously in need of more such content, Nic has released a ton and a half of CDRs on his own label Isolated Now Waves, all of which are now required by law to be placed in many of the asylums and psychoanalytic facilities of East Vancouver, as therapy for the deranged inmates. Score so far: eight rubber rooms and a double straitjacket. 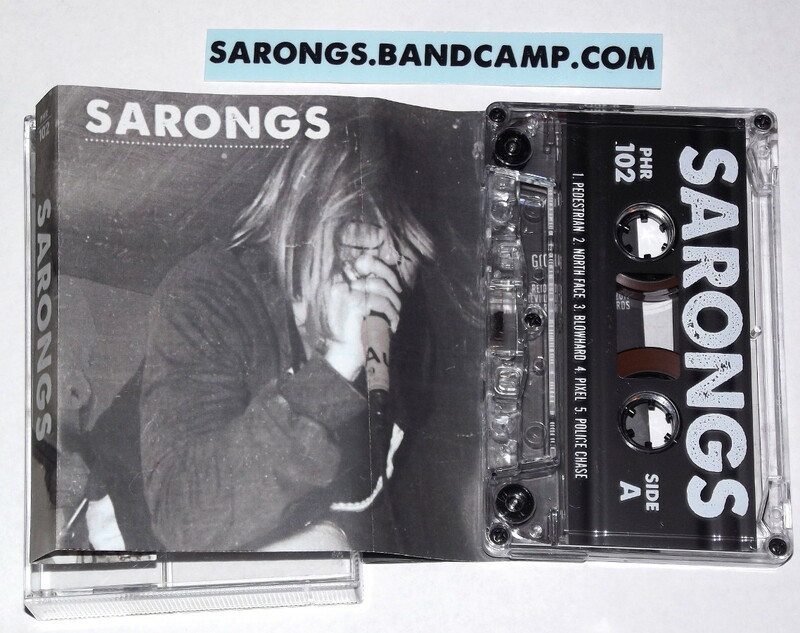 Sarongs are a New York punky type band from Syracuse, who have had a couple of albums out on Velidoxi Records in recent years, and this tape (PHR 102) is a reissue of one of them from 2011. Kind of disappointing in this context; granted, they have the sneery and snotty attitude, the right guitar moves, plenty of spiky angular forms jutting out of their sides like metal wings on a spinning carousel, oodles of mindless repeated patterns, and lead singer Lindsey Leonard really throws herself into her role with gusto and abandon. But they’re also trying to write songs, and songcraft is not their strong suit. I’m all for a bit of structure, but these songs are too mechanical in the way they follow chorus and verse structures, and judging by the sheer quantity of vocals breathlessly packed into each track, Sarongs clearly have something they want to tell us. Somehow all of this gets in the way, and the music doesn’t flow as naturally as it could. Score so far: 20 marks for attitude, but minus 80 points for excess verbiage. Brian Ruryk is another Vancouver experimenter, something of a war-scarred veteran of noise, who hasn’t been seen in the pages of TSP since issue five in 1999. On the strength of Weird Doods (PHR 107) he’s from the school of trash-noise, intent on smashing things and heaping up formless rubble to create confusing, frustrating sound events. Chaotic, but not especially harsh or repellent; the plan is rather to disorient the listener with broken pieces of information that don’t connect in meaningful ways. Some guitar playing does emerge from the midst of this garbage-pile now and again, only to be swamped by another delivery of fresh wreckage from the car-compacting unit nearby. I have this impression of Ruryk as one who perceives all culture as a meaningless sprawl left behind in the city after a destructive tornado has wiped it out, and if he finds anything still working in among this carnage, he smashes it with a baseball bat. I would give a final score to Ruryk, but he’s already smashed up my electronic scoreboard. 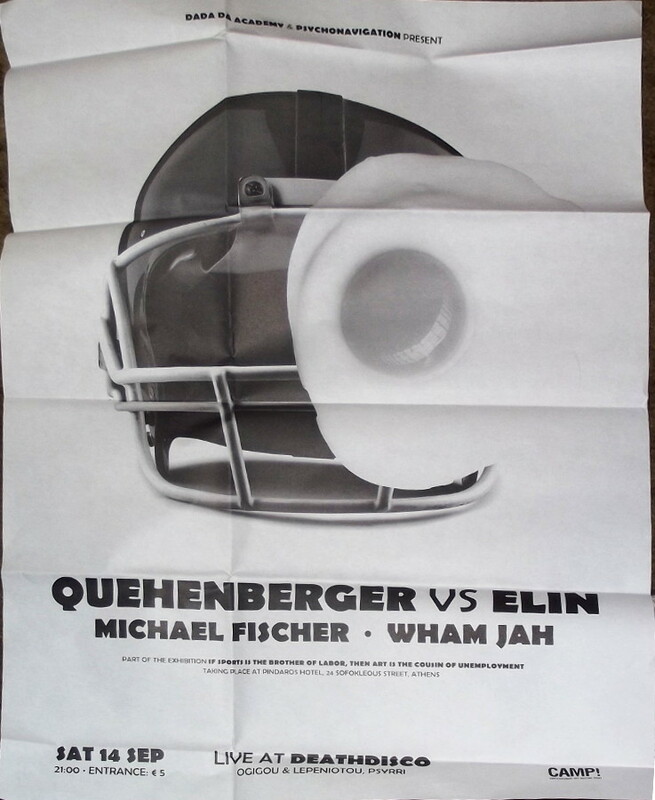 Also pictured, a poster for an event featuring Wham Jah (not the headliners) and other bands, communicated by means of a US football helmet and a fried egg. Note that this event probably took place September 2014.